If this is you, know there IS a way out. Start here: these are six of the best tips to help you curb your closet eating. Overcoming closet eating MUST start from a place of self-respect and self-love. Those who binge eat are usually covering up years of insecurities and feelings of failure. Getting over these feelings is a process that takes time, but it is absolutely possible! First, let yourself be forgiven for your past actions. 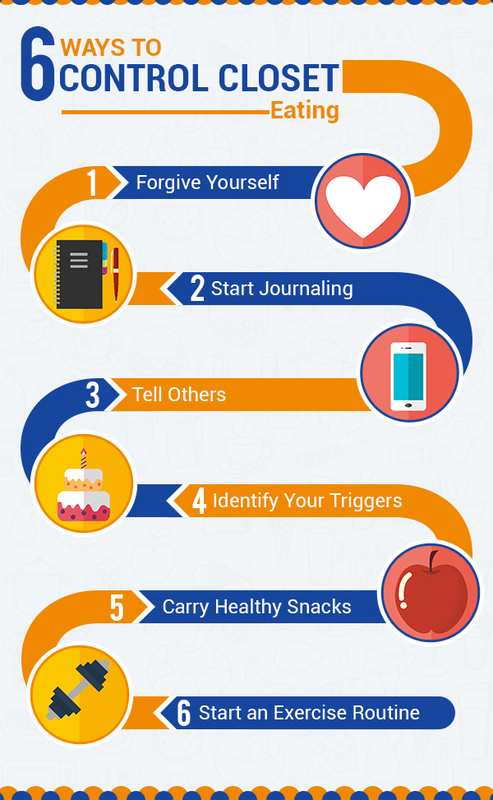 Holding onto guilt about your current eating habits only makes recovery worse, leading to a vicious cycle of self-deprecation and more closet eating. Stop the cycle now and forgive yourself! If you don’t have a journal yet, buy one today. Just do it. It doesn’t have to be fancy, just something you can write in regularly. Start writing about how you feel before, during, and after you’ve binged. A small pocket book is a good idea so you can carry it with you and write down feelings as they come. Closet eating usually involves coping with difficult emotions, so think about your triggers. Did something cause you to feel sad, angry, or stressed before the closet eating? If you journal about these regularly, you’ll be able to detect certain patterns. Then, you can help prepare yourself next time you’re exposed to triggers. It can be really hard to talk about your problems with others, but this is an important step in helping yourself. Confide in loved ones, especially if their habits or behaviors might be affecting your eating patterns. You can also search for a binge eating support group online. Connect with other people who understand your struggles and are also actively trying to change. Closet eaters have certain unhealthy, often high-fat and high-calorie foods that trigger them to closet eat. Make a list of the foods you binge on, and consider them “no-no” foods. Since most closet eating happens at home, don’t stock your home with these foods so you aren’t tempted after a long day. If you have kids or other people in the home who request those foods, stand firm. Remember you are showing yourself love and respect by not keeping foods in the home that sabotage your health, and the unhealthy foods don’t benefit your family’s health either. Did you know that cravings often mean you’re lacking important vitamins and minerals? Eliminate this problem with an all-natural, high-quality supplement like Mimi’s Miracle Minerals. It’s important to allow yourself to eat when you’re hungry. The cure for closet eating is not another diet. Always make sure you have healthy, filling snacks available for when you’re hit by the urge to eat in secrecy. Nutrient dense and naturally lower-calorie snacks will help keep you feeling full, which helps prevent reckless eating. Find a type of exercise you at least slightly enjoy. Working out can help boost your confidence, increase your energy, and encourage you to make healthy eating choices too! Closet eating may feel like it’s controlling your life, but you have the power to stop it in its tracks. Remember not to dwell on your past actions; focus on making a change TODAY. Laxinis World Stainless Steel Cooking Utensils Review: Measuring Cups and Measuring Spoons	10 Easy Everyday Fit Tips!